I take my time leaving Hotel Alma this morning. 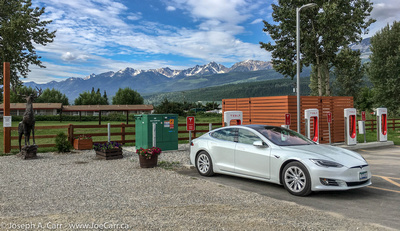 Traffic is light as I drive west from Calgary through the Foothills and the Kananaskis area to Canmore, where I stop to recharge my Tesla at the Supercharger. I grab a cappuccino from Beamers Coffee, which is about a 7-minute walk south of the Supercharger. Back at the Supercharger, while enjoying my coffee I take a photo of the old Moon over the south end of Mt. Rundle before resuming my drive. The very popular Castle Junction rest stop offers the classic view of Castle Mountain, the Sawback Range and the Bow River. I use three different focal lengths of lenses with my dSLR to capture the scene (see banner image above for cropped fisheye view). I discover later that my telephoto shot of Castle Mountain also captured a raptor in flight near the mountain – bonus! I pull into the rest stop at Eldon in Banff National Park for a rest and to have some lunch. 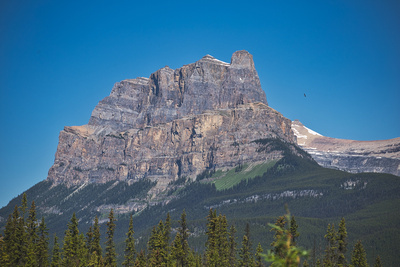 Before resuming my drive, I take a panoramic photo of Castle Mountain from this viewpoint – there is spectacular scenery everywhere you look in the Canadian Rockies! I recharge at the Golden Supercharger for a half hour before driving Rogers Pass to Revelstoke. Tackling the highway construction westbound doesn’t seem as bad as the eastbound experience. This is the second-longest driving segment for my road trip, so I’m tired by the time I arrive in Revelstoke later in the afternoon. I’m staying at the Swiss Chalet Motel in Revelstoke on the main drag: Victoria Ave. The Village Idiot Bistro is recommended by the desk clerk, so I go there for dinner. It’s a very casual place with a patio going full bore since it is about 27°C downtown. I sit inside out of the sun and have a High Country Kolsch draught (Mt. Begbie Brewery). 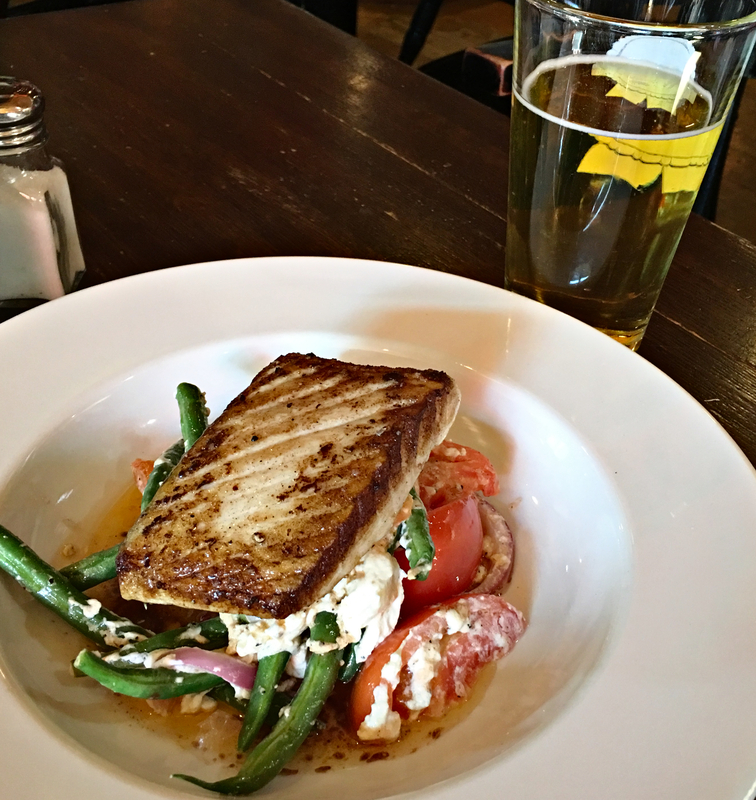 It is kind of sweet, but it’s a good summer beer that goes well with my grilled halibut entree.The halibut is excellent, served with grilled tomatoes, green beans, onions, and goat cheese – a very heart-healthy choice. I have a Standard Queen Room in the motel, which is small, but nicely updated with a Queen bed, fast Internet, full bathroom, and air-conditioning. Each unit has a parking spot right outside the door, and the office doubles as the breakfast room. The motel is centrally located – it’s an easy five minute walk to the railway museum, and a 15-minute walk to the shops downtown. There is free parking downtown if you drive. This entry was posted in Alberta, British Columbia, Canada and tagged birds, electric vehicle, EV, food, highway, Moon, motel, mountains, restaurant, road trip. Bookmark the permalink.